No birder likes to see a weak, struggling bird at their feeders, and there are ways to prevent spreading diseases at your bird feeders to help keep local bird populations strong and healthy. While wild bird diseases cannot be prevented (birds don’t wash up before eating and aren’t picky about hygiene), it is possible to minimize the effect of disease outbreaks if you know what to look for and what steps to take when sick birds appear. While these symptoms can alert birders to possible disease outbreaks at their feeders, many birds will not exhibit easily observable symptoms of illness or distress. In many cases, the first sign of illness is dead birds that do not show trauma or injuries. When birders find dead or ill birds, however, they can minimize the effects of a disease outbreak by taking simple steps in their own yard. If you find a dead or sick bird at your feeders, it is important to take action quickly so the infection does not spread to other birds. Clean the Feeders: Immediately clean and sterilize your feeders. While you should clean feeders regularly, more frequent and more vigorous cleanings may be necessary during a disease outbreak. Be sure to clean perches, feeder poles, trays, and any other surfaces birds frequently come into contact with to minimize bacterial spread. Clean the Ground: Many birds prefer to forage on the ground or will eat spilled seed when feeders are crowded. Clean the ground beneath feeders thoroughly and trim grass and plants as short as possible to minimize infected surfaces. Clean Bird Baths: Many disease-causing bacteria or insects that transmit disease thrive in water, especially stagnant water sources like bird baths. Thoroughly clean and sterilize bird baths regularly to minimize the spread of diseases. Spread Out Feeders: The more birds that feed in one small space, the more possibility there is for spreading disease. 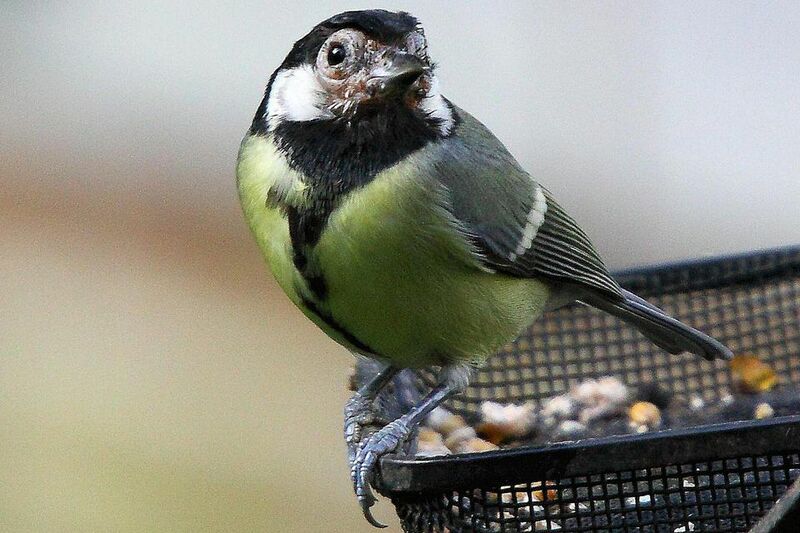 During a disease outbreak, remove feeders with large numbers of perches and opt for designs that give birds more space. Similarly, spread out feeders over a larger area to reduce the amount of contact birds have with one another. Inspect Seed Supplies: Inspect your store of birdseed for signs of mold, mildew or spoilage that can cause disease. Immediately discard any questionable seed so it will be out of reach of wild birds. If pet or bird food recalls have been issued in your area, compare the recalled items to your supply and discard any affected products. Remove Feeders: If you offer many feeders in your yard, consider removing some of them during a disease outbreak to encourage local bird populations to disperse. Birds from different flocks often congregate at the same feeders and can spread diseases quickly, but without that shared food source they are less likely to come into contact with one another. Dispose of Dead Birds: If you find dead birds near your feeders or in your yard, dispose of them immediately and in a way that will not be accessible to other birds, pets, or wildlife. Contact the Authorities: While all birders will occasionally find a dead bird, if you find more than one bird in a short period of time, or if you find several birds of the same species that have been affected, contact your local wildlife services office, wildlife rehabilitator, or Audubon chapter to report the situation. They can help determine the cause of the bird deaths and will be able to spread warnings to the community to help minimize the impact of any disease outbreak. Many types of bird diseases can also cause infections in humans, and conscientious birders will take the necessary steps to protect themselves even as they work to minimize the outbreak’s affect on local bird populations. Always wear gloves when handling birds or cleaning and refilling feeders. Wash your hands thoroughly after handling birds or feeders, even if gloves were worn. Do not bring sick or dead birds indoors at any time. Keep children and pets away from bird feeding areas. Listen to local newscasts and birding news to stay informed about bird disease outbreaks. By knowing how to recognize bird diseases and understanding what steps to take when illness occurs, birders can minimize the outbreak in their yard and keep local bird populations healthy and thriving.